found a booth which was offering temp’ral projections. he sat in the chamber and paid in the dime. in all sorts of genres; he chose science fiction. not slaves of night or day. one each of time and space. is just a further place. flew faster than he ran. the killer found out why. it’s far outpaced by souls. they can’t see through black holes. to steer it back toward birth. to think it was not yet its time. They fused to make a whole. Our fact-hungry viewer went next to biography. so he pressed on the button that said ‘film d’amour’. and completely forgot his beginning. then selected a horror and braced for a scare. In my continuing quest to do everything that Jonathan Coulton does, I’ve used all the words from everything I wrote from the Ace to the King of spades (including letter-inspired writing from that period) to create this most excellent word cloud at the even more most excellent site Wordle. My first attempt had the words ‘I’m excellent’ perfectly aligned, but then I went and changed the font. Still, there are some interesting messages to be found in this one. In English I can breathe like air. to water that I’m choking on. et rester dans la neige qui fond. dans l’eau française, courante et claire. 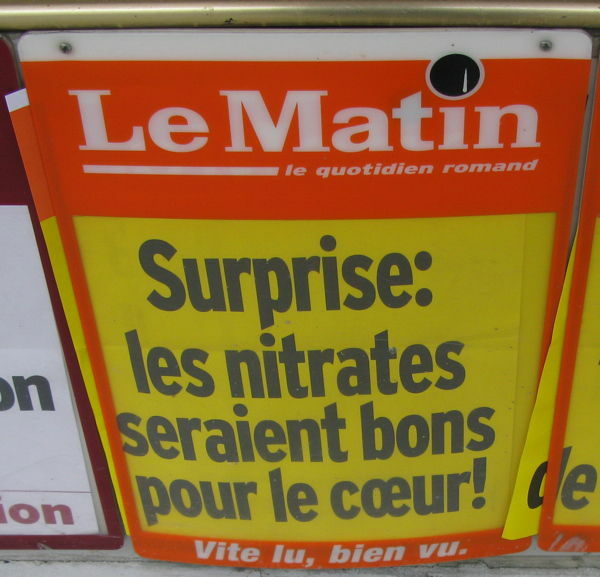 Or if you’re French, Surprise: Nitrates are good for the heart! Isn’t that what I said in last week’s Thing? Clearly I chose the right suit to post that poem in. And the right deck as well — this is indeed an intriguing development. And as if that weren’t enough, while I was still downloading that image from my camera, I found out that Jonathan Coulton is coming Over Here again, for concerts in London and elsewhere. I booked a ticket in the panic, hopefully I’ll be able to go. Perhaps I should self-publish the spades already so I’ll have a nice shiny book to give him. Nitrogen, we breathe and we ignore. We do not know what we are breathing for. is there to simply breathe, and nothing more. breathe out, breathe in, breathe out, keep up the pace. The air, the breath, the life, no more inert. Your heart is not a mere ignoble mass. Take nitrates, and create some biomass. Breathe in, breathe out, breathe in this noble gas.